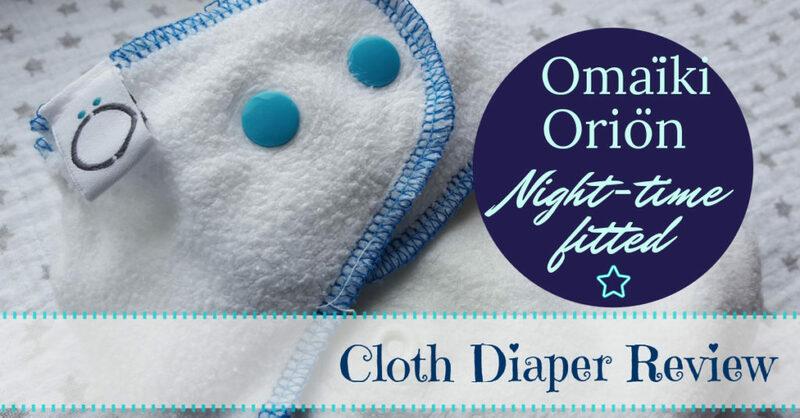 I love fitted cloth diapers and have several brands in my collection, so when Olivia at This West Coast Mommy asked me if I’d like to review the new Oriön fitted diaper for Omaïki, I jumped at the chance! Fitted diapers are great for both daytime and overnight use, and they work under all types of covers. I especially enjoy using them under wool pants that have been lanolized to use as diaper covers. This particular fitted is new on the market, and is definitely one to consider for both its quality and price point. Disclosure: I received this item at no cost to facilitate my review. All opinions are my own, honest and unaltered. 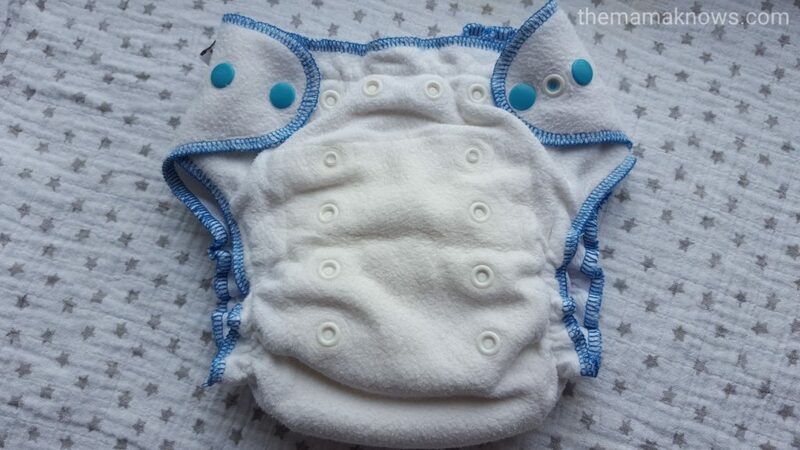 The Omaiki Orion Fitted Diaper comes with a lay-in insert. One side of the insert is Bamboo and the other is AWJ. Oriön fitted diapers are One-size and marketed to fit 8-35 lbs. It is Made in Canada with Canadian fabrics, and is a fair price point of $29.95. I believe that this is a competitive price for comparable quality currently on the market. The outer layer and insert are made of bamboo sherpa which is 56% bamboo viscose, 24% organic cotton and 20% polyester. The lay-in, foldable insert is two-sided and has a Stay-dry lining of 100% polyester mesh AWJ (athletic wicking jersey). This is a fitted diaper, which is not waterproof on its own. You will need a cover for it, and it fits nicely under many different brands. It also can be used with lanolized wool covers and wool pants. The snap closures on the Oriön fitted are very sturdy and placed thoughtfully, with the crossover snaps as needed for tiny babes. I love the colours of the snaps, which are a lovely turquoise. They contrast well against the white diaper and blue stitching. It’s an attractive fitted, for sure! The rise is two columns with four snaps down. This gives you a small, medium, and large as well as the wide-open extra large setting. 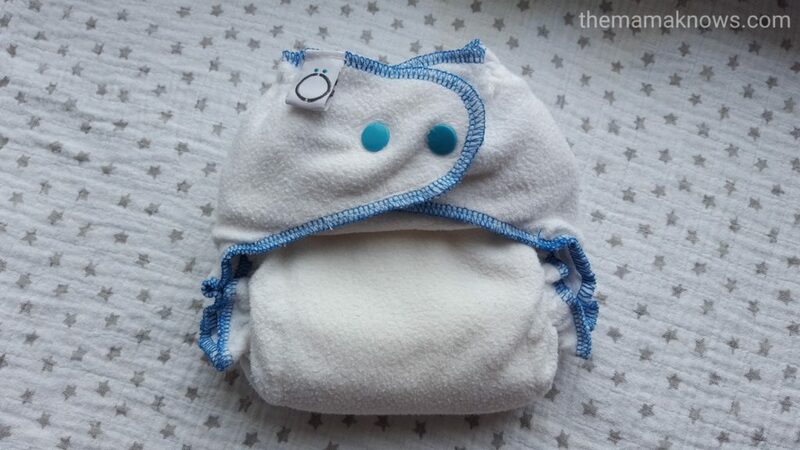 The rise snaps are white and blend in with the body of the diaper. On its largest setting there is room to spare on my other child, a 30 lb 3 year old test subject. My 12 month old son is a petite guy, long and skinny, and he wears this diaper on the smallest setting. He is currently 19 lbs and fits pretty roomy in his 12 months clothing. The leg elastics are snug, but not too tight, and I believe this would have fit us personally from about 10-12 pounds. I used this diaper during the daytime, and as an overnight diaper, and I am happy to say we had no leaks either way! I did fold the insert differently for night time, with several layers up front for my tummy-sleeping boy, and less at the back. This ensured there was lots of absorption for overnight. During the day I just went with a simple half-fold. We love a stay-dry effect for over night, so I did use the Athletic Wicking Jersey face up. This keeps my baby’s skin relatively dry, though not as much so as microfleece. The plus-side is that poop comes off this fabric really easily! My son sleeps 12 hours typically, occasionally nursing once overnight, and this diaper held up well. Omaïki sent us their One Size cover to use during testing, which fits us very big. The tag says that it fits 8-35 lbs, but I couldn’t get a good gap-free fit around his legs with this cover, even on the smallest rise. For comparison, this cover is physically the same size as a Size 2 Thirsties cover which fits 18-40lbs. 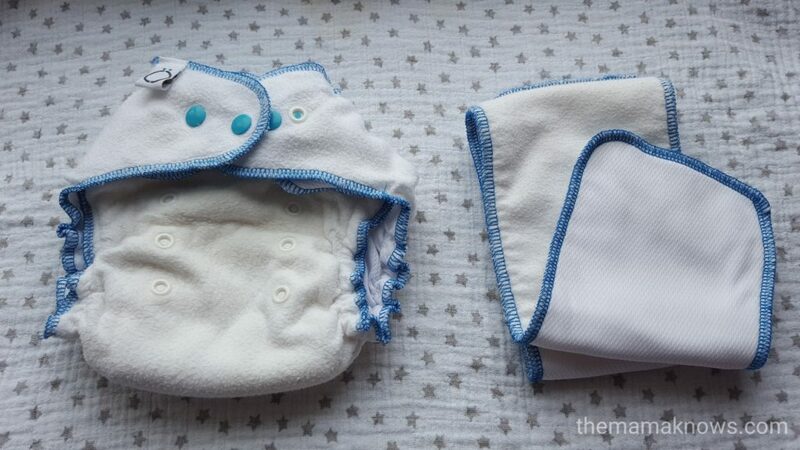 Since the Oriön fitted diaper underneath had no gaps, and fit him great, there were no leaks or messes. I do prefer using other smaller covers, though, especially my wool ones. This is a great fitted diaper, and I’m pleased to add it to my stash. I love that it is Made in Canada and the materials are of good quality, soft, and cozy. Absorbency was pretty great as is. It is a good size too, so there is room to add boosters, if needed, without issue. The leg elastics are gentle and snug, so even when we had a bout of the stomach flu, there were no messes. I’m not finding much on the downside here, as the Oriön is a great fitted diaper and I wouldn’t change anything on it. 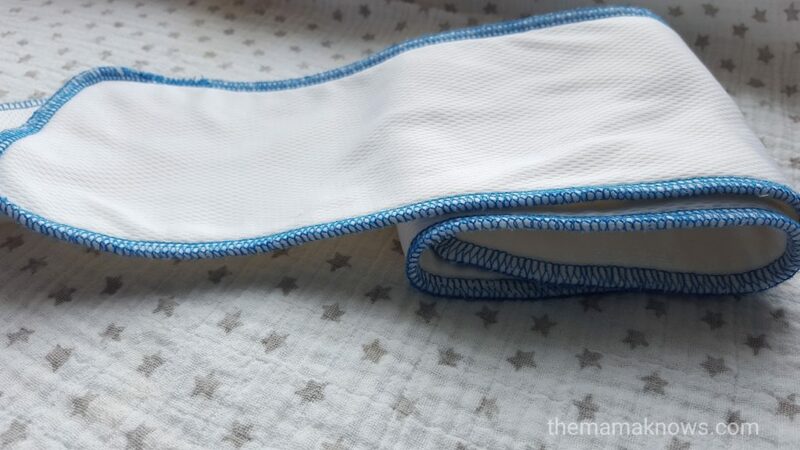 The only thing I might change is on the Omaiki diaper cover that we used, as it was much too big for us and had no real grab from the leg elastics. I would label it Size 2, and not One Size. The Oriön fitted is a solid performer! I’m pleased to recommend this fitted to my readers. It’s a great night-time option as is, with room to customize absorbency for heavier wetters (P.S. AMP 3ply hemp boosters fit perfectly). The price is reasonable at $29.95 so you can easily afford a few for your overnight stash. 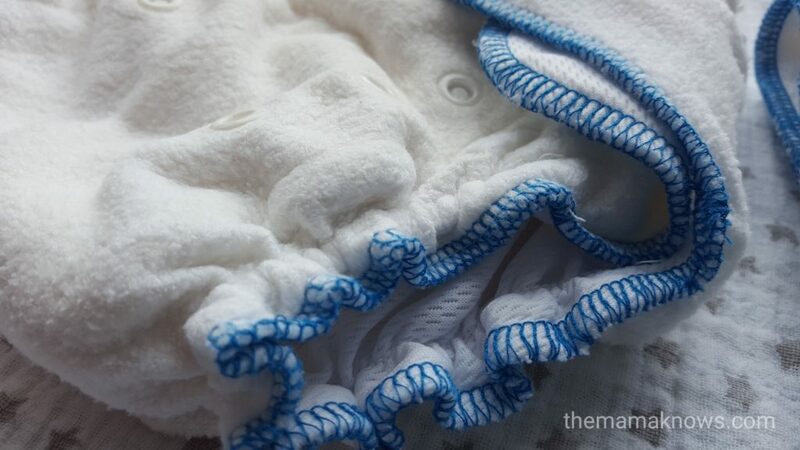 You can purchase these diapers from Omaiki.com! 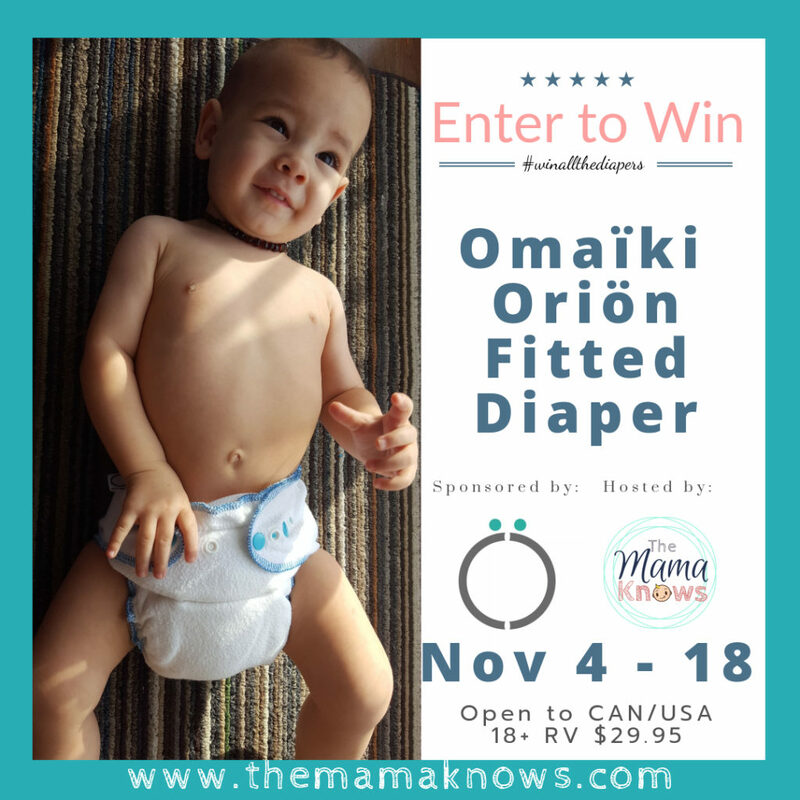 You can enter to win your own Omaiki Orion Fitted Cloth Diaper courtesy of Omaiki! Disclaimer: This giveaway is Open to Canadian and Continental USA Residents only. Prize is sponsored and shipped by Omaïki and hosted by The Mama Knows. The winner will be notified by email and must respond within 48 hours to claim prize. All entry requirements must be met, and each entry will be validated. This giveaway is not affiliated with Facebook, Twitter, Instagram or Pinterest. The Mama Knows is not responsible for lost mail or prizes unfulfilled by sponsors. Hi There, please be sure you write “enter” in the box on the entry widget, not here in the comments. Thank you! The roominess of the Omaiki bamboo fitted sounds like it might possibly have a long enough rise for my tall LO. We have always loved using fitteds, but he sizes out of them way early because he’s so tall.